Bring back more 90s brands! We all collectively freaked out when we got word that Undefeated was teaming up with Patta and FUBU for a nostalgic 90s-centric take on the Puma Clyde. Now the Puma Clyde is helping resurrect another staple from that era: COOGI. The Australian clothing company teaming up with the German sportswear brand Puma brings back the infamous Biggie COOGI sweater look to the sneaker. The premium construction that features a black leather upper with a patterned formstripe and lining matching metallic gold branding on the side panel and tongue. That particular pair will be priced at just $120 USD and even features 18K gold plated lace tips and eyelets. 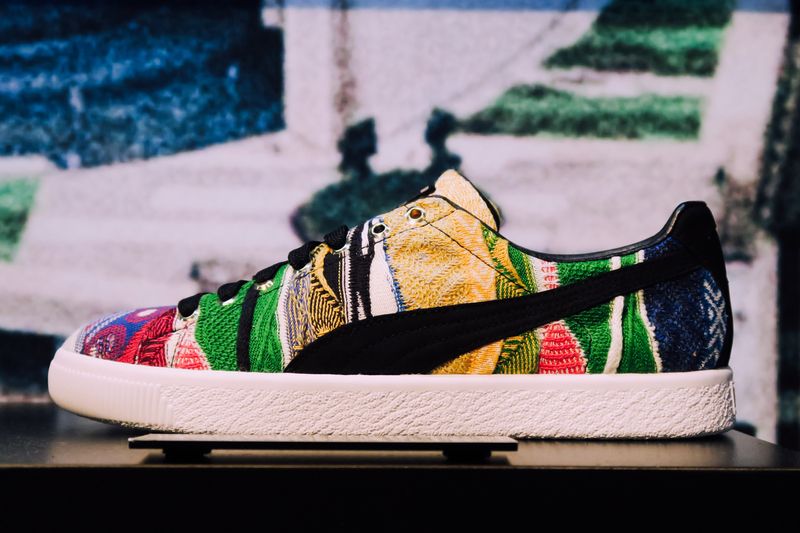 But if you’re looking to go full COOGI sweater from head-to-toe, there’s also a limited COOGI x Puma Clyde featuring a base made entirely of knit material for $200 USD. Check out the full apparel collection below and grab your favorite option this Saturday, May 20th from selected retailers and lookout for the release of the black pair on May 25th.